The World Meeting of Families 2018 has announced details of the process for individuals and groups to book tickets for the WMOF2018 events in Knock Shrine and Phoenix Park on Sunday 26 August. It will not be possible to attend both venues on Sunday 26 August due to the timing of these events. There will be no admission to either of these venues on the day without a ticket – all adults and children attending these events will need to have a ticket in advance. Tickets will be free and will be available to book from Monday 25th June on www.worldmeeting2018.ie. At the time of booking there will be an invitation to make a voluntary contribution to the WMOF2018 to offset the costs of the event. This is optional and will have no impact on a person's ability to access a ticket. Pope Francis will visit Knock Shrine on the morning of Sunday 26th August to pray for families and the WMOF2018. He will arrive to Knock Shrine at 9.45am where he will visit the Apparition Chapel and then give the Angelus address on the square in front of the Shrine. He will depart the Shrine at 10.45am. There will be a capacity of 45,000 for Knock Shrine. Tickets for Knock will only be available through the online booking system on www.worldmeeting2018.ie. Tickets for the Knock Shrine event will be printed and posted by 31 July to all those who have successfully booked via the website. Those booking tickets must give an email address and details of where they will be travelling from on the morning of the event. This information will be used to inform the overall transport plan for the area on 26 August. The Closing Mass of the World Meeting of Families 2018 will take place at the Papal Cross in the heart of the Phoenix Park in Dublin on the afternoon of Sunday 26th August. The Mass will begin at 3.00pm. The WMOF2018 will issue 500,000 tickets for the Mass in Phoenix Park. These tickets will only be available through the online application system on www.worldmeeting2018.ie. Tickets for Phoenix Park will be issued by email as a 'print at home' ticket by 31 July. The tickets for Phoenix Park can only be offered in this format because it would be cost prohibitive to print and post this number of tickets due to the size and scale of the event. Phoenix Park is one of the public city parks in Europe at 1,750 acres. Given the scale of this event and the strict Traffic Management plan that will be in operation, all routes into the park will be assigned to ticket holders in advance and will be colour coded. Each ticket will give you access via a single route and gate and ticket holders will not be permitted to change gate on the day. The gate used by a ticket holder to enter the Park will also be the one they use at the time of exiting the Phoenix Park at the end of the Mass. Parish groups are invited to register for tickets for the WMOF2018 Closing Mass and for a parking slot for their hired private coach/bus. Parish group bookings need to be completed by a designated 'Parish Leader'. All parish bookings will be verified with the parish and with the private coach or bus operator. Those travelling on the coach do not need to book separately for other tickets. 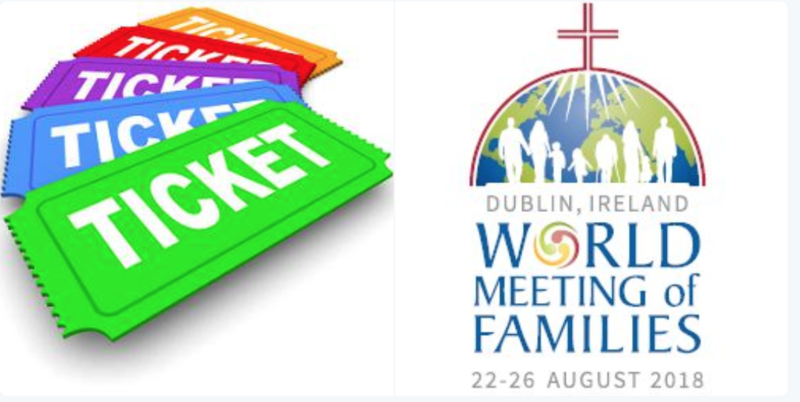 The World Meeting of Families is partnering with tickets.ie to provide the online ticket service for the WMOF2018 events. Tickets.ie are an Irish owned company who handle ticketing for thousands of events annually.